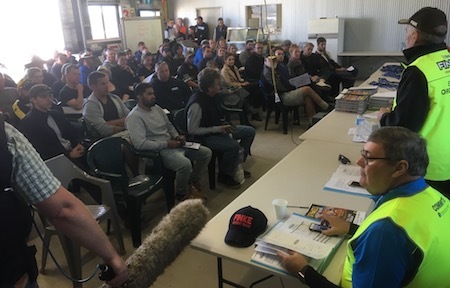 The thrills of the Tatts Finke Desert Race will be told by 101 media workers briefed by the organisers this afternoon (at right), including Alice-based Brindle Films which will combine a documentary commissioned by the race committee with a feature-length movie. It will have a cinema release in Australia “hopefully followed by some sort of broadcast which is not confirmed as yet,” says Alice based director, Dylan River. The Brindle Films crew of 42 make up the lion’s share of 70 TV staff. The remainder include 11 press journalists and four working for online media. All media workers are from Australia but the organisers say they are supplying information to a number of international magazines and websites. Mr River (at left) says the feature film has been in development for three to four years, “trying to get money to do it”. This year Brindle succeeded, and filming has been under way since January. 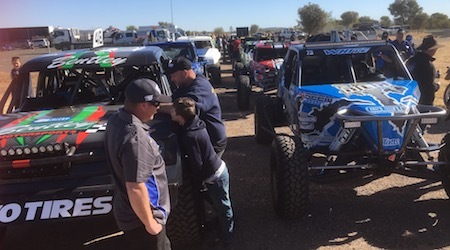 Footage shot by the company at last year’s Finke will also be used. Three helicopters will be used and 20 cameras, along the track and also in other locations to record the huge involvement of locals in the running of the event, and participating in it. Brindle Films has produced the six-part TV drama 8MMM Aboriginal Radio about a motley Indigenous crew and misguided whitefellas running a radio station in Alice Springs; and three documentaries: Blown Away, 40 years after Cyclone Tracy; The Song Keepers, a hidden musical legacy of ancient Aboriginal languages being preserved by four generations of song women; and Occupation Native, about the optimistic hope of recognition in the National Constitution. What’s the budget of the Finke movie? PHOTOS: At top – Finke president Antony Yoffa addressing the media this afternoon. Vice-president Damien Ryan is in the foreground. Above right: Buggies awaiting scrutineering this afternoon.